On the way back from breakfast Jim says "Elaine, check your tire". I do; it has air. Specifically, (nearly) the same amount of air in the soft rubber tube as the end of yesterday's ride. The pressure works with the outer, more robust tire to resist force against the rim. Acting like a spring against the road and creating what physicists call a contact patch, one of the right shape and size. Thus enabling the bike to reliably move forward. In other words, ready to roll. Tolstoy said that happy families are all alike; every unhappy family is unhappy in its own way. On the bike, days that are full of struggle and hardship generate too many words. Even alone on the road yesterday, my head was noisy with thoughts. Am I going to make it to that point? What's Plan B (or C)? What's the best way to prevent this? On the other hand, days without any major trouble become long, quiet meditations. Just turn the pedals over and over, letting thoughts run where they will. With any luck today will be one of those days. The route is flatter and shorter than Friday or Saturday. There's one hill, a long, slow climb. The landscape is an ideal canvas - minimal traffic, transcendent sunlight. 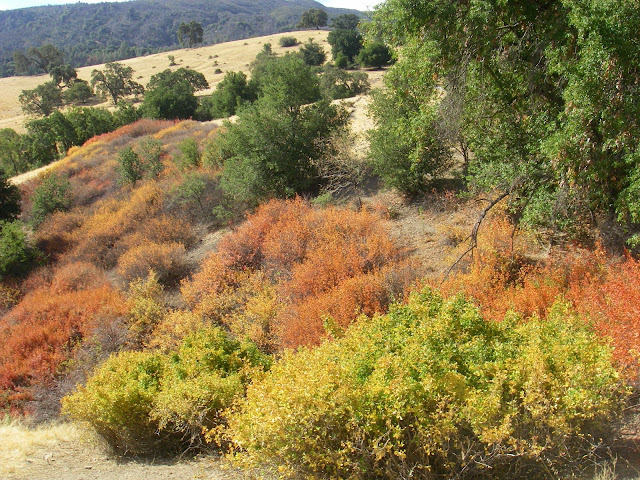 And the road itself is a dream, threading the contours of the northern Santa Lucias, golden California hills studded with oaks. Today is a pilgrimage of sorts. 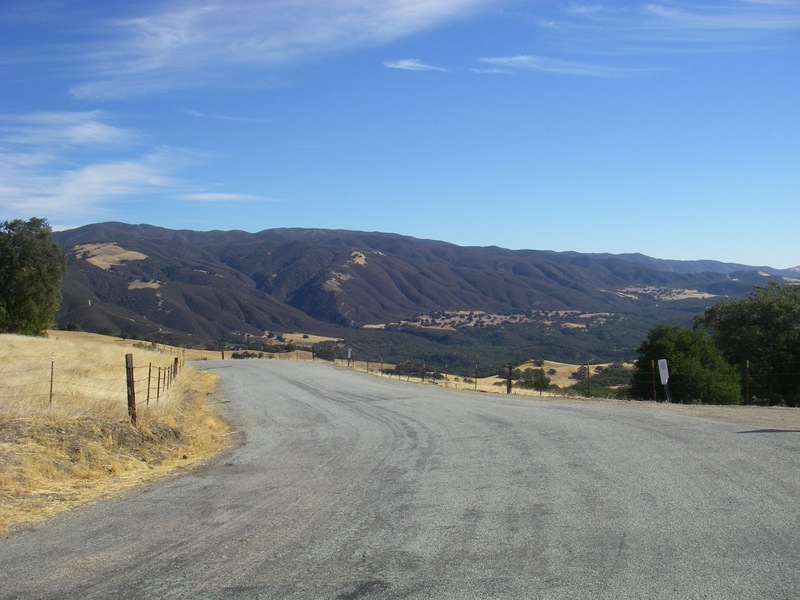 The road (formally G16 but also Arroyo Seco Road, then Carmel Valley Road) is fairly remote and far from home. Once a year, with this group I'm here to appreciate it. Without understanding exactly why or what happens, the process or its transformative effects. Give me these 74 miles to get clean. Climb the hill with reasonable effort and speed. Chat on the way with other cyclists, nothing too deep or long. Don't solve the world's problems or even my own. Descend under a canopy of oaks toward Carmel Valley Village. Keep the bike upright, away from vertical grooves at stream crossings. 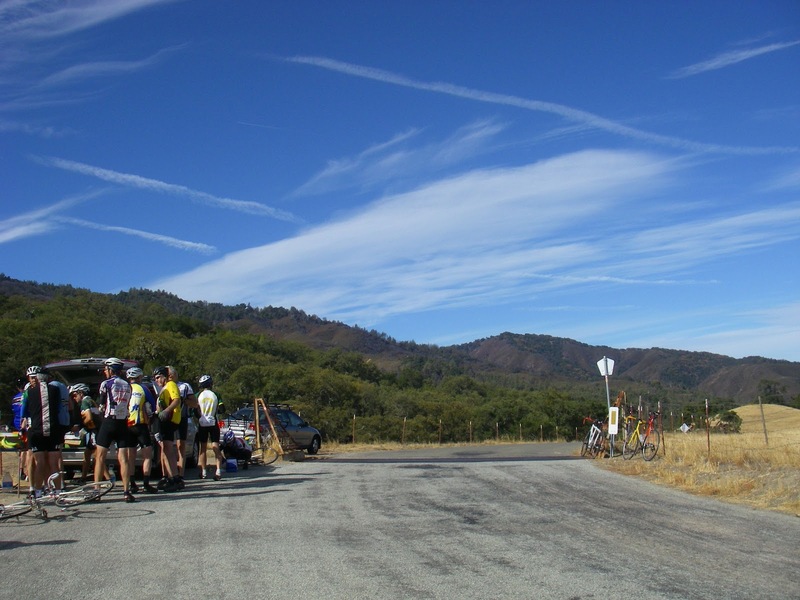 Turn at Tassajara Road and take the Cachagua loop. Breathe deeper in that section, one of the most beautiful roads anywhere. Find the hidden market and get lunch (green chili with pork and iced tea). Remember that the end comes about an hour after I'm ready for it. Cahoun Pass (2400 feet), looking west. On any given day, at any point on the earth's surface there is a hidden universe. A million billion things you rely on without realizing they can go wrong. Something like that little oval curved area on the surface of a bike tire, the contact patch. The way a tire actually acts as a spring when the tube inside is full of air. A brain injury does not feel like one thing gone wrong in an amusing or at least interesting way. It feels like bad music, a set of things that went wrong and then decided to interact with each other. When this happens it becomes impossible to just live in the moment, on the surface of things. Life becomes about fixing it. More than anything, I want more good days. I want to relax and not pay close attention for a while and just have things work out. I don't have too much to say other than the last two lines in this really spoke to me today. It's days like this that make me love my bike - because there's the chance that it becomes a quiet day of just turning pedals. Oh, wait, I do have something: you mentioned the croissants are better in Nice a few entries back. Have you biked to the Whale City Bakery in Davenport? 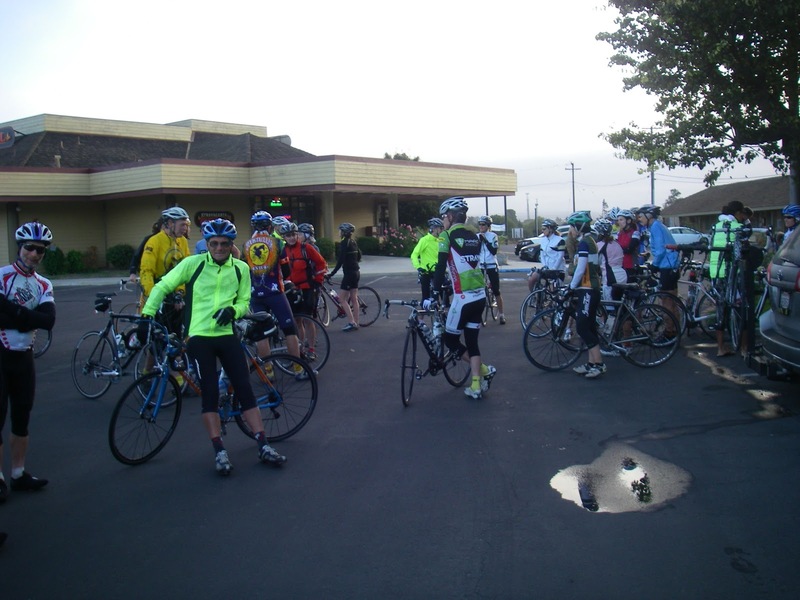 I was there on a Saturday for a ride, and the croissants were wonderful (this from my very picky boyfriend, who only seems to like the croissants at Hannah's in San Jose.) Not too doughy, buttery, flaky, and delicious. Your comments are always appreciated, Rachel! I love that meditative feeling as well. I've heard that the croissants at Tartine in SF are good too, but I can't stay in there too long. The air is heavy with butter!